Hanoi (VNA) - More than 500 delegates, including hundreds of young people, partners and government officials from 20 countries, exchanged ideas, knowledge and experiences to influence policy initiatives on youth entrepreneurship and social innovation at the second Asia Pacific Youth Co:Lab Summit, which opened in Hanoi on April 4. According to the Asia Pacific Human Development Report 2016, more than half the young people in the world today live in Asia Pacific and 1.7 billion are under 25. The report further states that close to 71 million young people, aged 15-24, are unemployed worldwide, of whom 33 million are in Asia Pacific alone. Nearly 220 million young people are neither at school, nor at work, presenting a daunting crisis that calls for an urgent response. 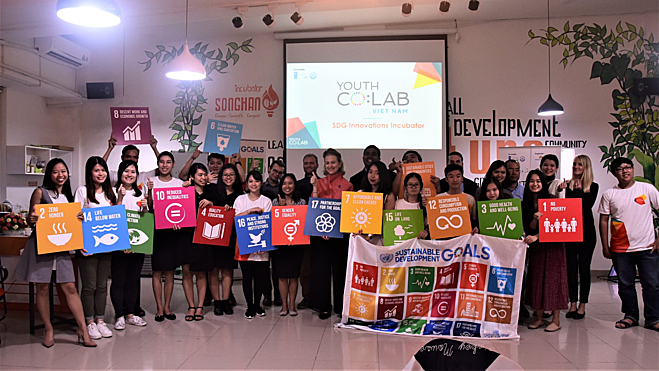 “This is how we can align the grit and determination of young change makers to meet the ambition of the SDGs,” she noted. Tran Van Tung, Vietnamese Deputy Minister of Science and Technology, said in the current context of global integration and development, startups and innovation play an important role in economic development, addressing global difficulties and challenges as well as achieving sustainable development in each country and all over the world. The Youth Co:Lab Summit 2019 is a significant event for the innovative startup community and the social impact enterprises, in particular. The summit will enable an exchange of ideas and help further developing the start-ups, through incubation, innovation, expanding connections and international cooperation, he said.